William and Marlene fell in love young, but now they’re 112 years old. William misses his youth, and Marlene wants to enjoy her well-earned wrinkles. They both wish they could spend more time with their grandkids, Skyler and Tyler. They’ve lost the magic. Luckily (sort of) for them, magic finds them when Nurse Nancy cooks up a spell to make them young again. Together, they must face a brave new world of terrible technology, pouty popular kids, and Evil Earl, another oldster who’s always loved Marlene. With the help of Tyler, Skyler, and psychic school counselor Tenzin Time, they must make each other’s wishes come true and return to old age. Old school romance gets a second chance in Vintage Love. 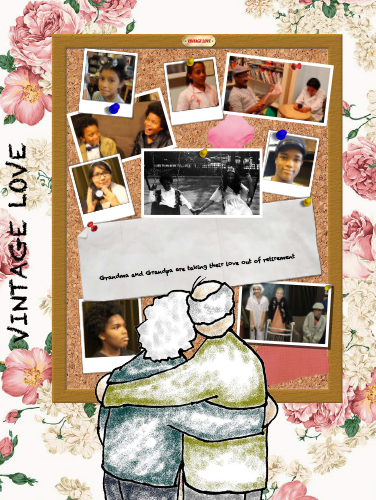 Vintage Love was produced during 826NYC’s summer filmmakers workshop.